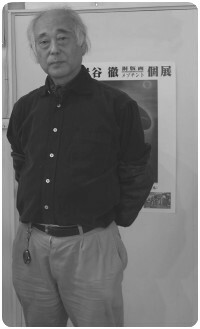 My name is Toru Iwaya and I've been a Mezzotint artist since 1972. Mezzotint is a copperplate printing technique, which requires enormous patience and is extremely time consuming. As you might imagine, it is difficult to persevere with this technique in this modern era when things change so rapidly. Despite the number of hardships I had encountered, I had been working in the same studio in Paris for 28 years, which, led to completion of over 150 mezzotint works. Most of my mezzotint works are small and medium sized. The characteristic of my color prints is that all the engraved copperplates (the color ones as well as the main basic one) are produced in Mezzotint technique. Very few artists still adhere to this traditional practice. The most notable characteristic of my work is the completion of 'Noh mask series' consisting of over 30 works (20 out of 30 are large-sized). You cannot find this anywhere else in the world. I hope you would enjoy the tranquility of my work in your study or your living room. Please visit my web page every now and then as I update this gallery every time a new work is ready.